Image Access regularly releases news and information to the press. The press releases below offer you the latest news in PDF format as well as photos and other graphics which can be downloaded in full resolution for publication. If you need more information, contact us: Debra Ingendoh, Marketing, Media and Public Relations. We will be happy to answer your questions and provide further details. Thomas Ingendoh, CEO and founder of Image Access, started the business in February 1994 from the ground up, with a vision of producing the best camera optics on the market. In the 25 years since, Image Access has become the technology leader in large format scanning. "We always focused on the core technology of scanners and grew from a camera manufacturer to today´s large format scanner manufacturer" said CEO Ingendoh. From its first graphic board with a full color resolution of 1600*1200, developed in 1994 and sold through Siemens Medical; Image Access has emerged to become a highly diversified wide format scanner vendor with the most expansive product offering in the industry -- not only sheet feed scanners up to 60" wide but also book scanners and flatbed scanners in various sizes and a large number of OEM devices. Image Access exhibits every year at the IFLA World Library Information Congress and will again bring the latest products to the 2018 IFLA Exhibition. On our booth B150, we will have a premiere as we display two new models for the first time at IFLA: the Bookeye® 4 V2 Semiautomatic and the WideTEK® 36ART. Image Access, the world leader in large format scanning technology, is introducing the WideTEK® 60CL, the largest WideTEK scanner. This new product complements the powerful line of WideTEK scanners, with models now ranging from 36" to 48" and 60" scanning widths. Speed can be up to 15"/s for the full width in grayscale but is limited to 10"/s for safe paper handling. In May 2018, Image Access will continue its worldwide tour with the Annual Meeting & Museum Expo in Phoenix, Arizona and the Museums + Heritage Show at Olympia London, UK. In April 2018, Image Access LP will attend two reprographic association conferences in the U.S. as a vendor sponsor; the RSA Shareholders Meeting in San Diego and the ReproMAX Annual Spring Conference. Industrial quality production scanner running at top speeds. 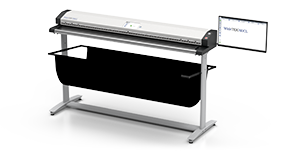 The WideTEK® 48CL-600 is the newest member of the CL series of wide format scanners designed by Image Access to offer industrial quality scanning without the high price tag normally associated with a scanner of this size for applications in architecture, surveying, reprography or media clipping.